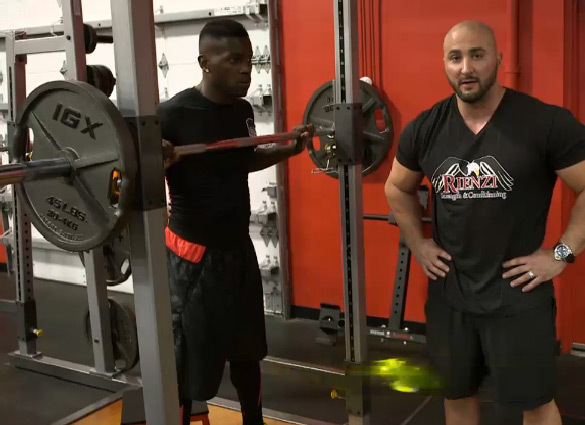 3-time Pro Bowler Antonio Brown has a great workout. 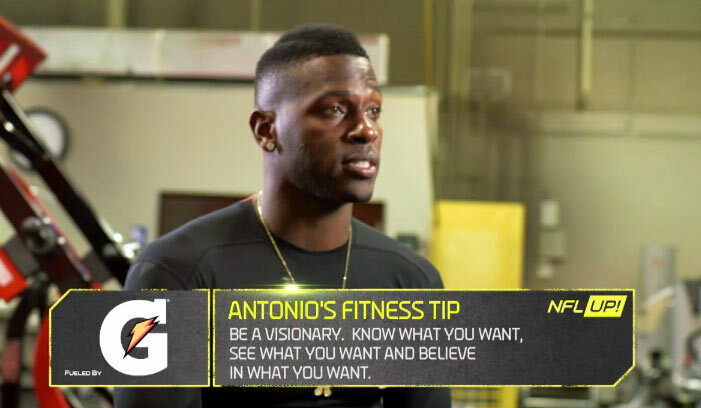 It’s designed to solve every NFL receiver’s biggest need: “How to get faster on the football field.” Antonio Brown’s trainer says the key to getting faster is spending time in the weight room. Together, they especially work on lower body strength training. The Lateral Step-Up Jump helps Antonio Brown with his explosiveness. This exercise helps a wide receiver when getting off the line of scrimmage, making his breaks and jumping to catch the ball. Brown says it doesn’t matter how speedy you are, if you can’t explode quickly. Brown’s trainer says to start by putting one foot on the platform, and exploding upwards. Drive first through your heel, but push off your toe, while jumping laterally. Land on the opposite foot, and make sure to slow down, so you can focus on exploding into the next rep.
Reps: Do 3 sets of 8-10 reps (side to side = one rep). This exercise helps increase your overall explosiveness. It helps you to be explosive laterally, explosive agility when you move, and explosive when you jump to catch the ball. The Box Squat key to developing the posterior chain. This chain consists of the glutes, hamstrings and lower back. This helps Antonio Brown gain the power and strength he needs for quick bursts of speed. Antonio’s trainer says the key to his exercise is to drive through your heels. By putting the weight on your heels, you’re able to really work your glutes. This helps with your strength and endurance. You got to be able to give full effort every play. Maximum effort and full speed. 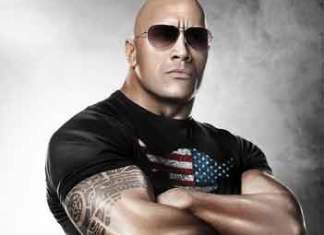 You’ve gotta lift a lot of weight to be powerful, and have a lot of endurance. 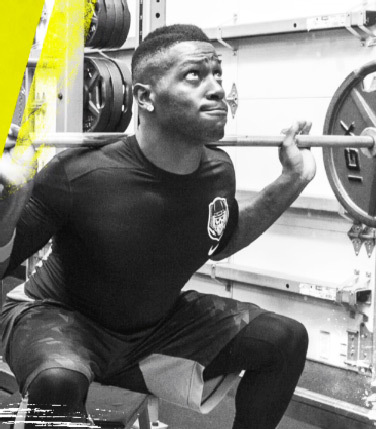 Antonio Brown does Walking Lunges with Barbell to strengthen his core and lower body. This exercise also helps to increase the Wide Receiver’s hip and hamstring flexibility. His trainer, Dave Rienzi, says the key is to take big steps. Don’t stop. Be fluid throughout the exercise. Doing Walking Lunges allows you to isolate each leg individually. Hamstring isolation is important for a Wide Receiver. In a NFL game, Brow often has to break off the strength of only one leg. This drill emphasizes your running technique. Being able to explode and drive high off the ground. It helps the posterior chain. It helps you accelerate on the field and helps how you move while running. During the season, Antonio Brown works with his Pittsburgh Steelers teammates. They include Wide Receivers Markus Wheaton, Martavis Bryant, Darrius Heyward-Bey, Jacoby Jones and Sammie Coates. Tight Ends Heath Miller, Matt Spaeth and Jesse James also get into the route running action. the strong your legs are, the more force you generate, the faster you’ll be, the more explosive you will be. The stronger you are, the better your chance to jump up and get that football. 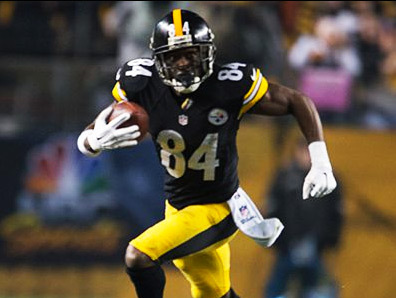 Antonio Brown’s stats include 6 years with the Pittsburgh Steelers. He’s recorded a Steeler-record 483 catches, 6,569 yards, 110 yards rushing and 35 touchdowns.